A new book, Encyclopedia of Cloud Computing, edited by San Murugesan and me, will be published jointly by Wiley and IEEE Computer Society in June this year. In a series of posts I will provide a brief preview of the book, followed by deeper focused discussions. The book covers broad range of topics aimed at helping you gain an informed and comprehensive understanding of the promises and the potential of cloud computing. 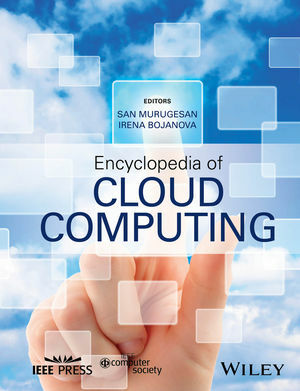 This Encyclopedia is unique as it presents in one volume the breadth and depth of cloud computing. It presents a holistic perspective on cloud computing by discussing its various facets and showing how to strategically embrace it. It provides IT professional, educators, researchers and students a compendium of cloud computing knowledge – concepts, principles, architecture, technology, security, privacy and regulatory compliance, applications, adoption, business, and social and legal aspects. The book, organized in 10 parts, presents 56 chapters on a wide array of topics authored by subject matter experts from industry, government, and academia. The book addresses questions related to technological trends and developments, research opportunities, best practices, standards, and cloud adoption that stakeholders might have in the context of development, operation, management, and use of clouds. Further, it examines cloud computing’s impact now and in the future. After gaining an overview of Cloud Computing in Chapter 1, a reader can study the rest of the chapters in sequence or hop to a chapter of his/her interest. The book is a handy easy-to-access informative resource book of value to academics, students, practitioners and researchers. Several books on cloud computing are available now but none of them cover all key aspects of cloud computing comprehensively. To gain a holistic view of the cloud, one has to refer to a few different books, which is neither convenient nor practicable. There is not one reference book on the market that comprehensively covers cloud computing and meets the information needs of IT professionals, academics, researchers, and undergraduate and postgraduate students. This encyclopedia serves this need and is the first publication of this kind. It is a great resource for anyone interested to explore and embrace cloud computing. Part 1 presents an overview of cloud computing concepts, cloud services, cloud hosting models, and applications. It also outlines the benefits and limitations of cloud computing, identifies potential risks of the cloud, and discusses clouds’ prospects and implications to business and IT professionals. · Discusses the fundamentals of PaaS and focuses on a specific cloud-computing layer, called application-Platform-as-a-Service (aPaaS). Stay tuned for further information on this new book in my upcoming posts. Irena Bojanova is a computer scientist at NIST. She serves as Integrity Chair, Publications Board, IEEE CS; a Co‐Chair of IEEE Reliability Society IoT Technical Committee, and a founding member of IEEE Technical Sub‐Committee on Big Data. She is Associate EIC of IEEE IT Professional, and AE of the International Journal of Big Data Intelligence (IJBDI), Previously Irena served as the founding chair of IEEE CS Cloud Computing Special Technical Community and EIC of the IEEE Transactions on Cloud Computing, She is a senior member of IEEE and can be reached at: irena.bojanova@computer.org.